Toronto – Did I just witness a NBA Ballet experience? From these humble eyes I would offer there never were more demonstrations of athletic movements akin to ballet than at the NBA All-Star Weekend in Toronto, Canada – the first All-Star event played outside the United States.With professional athletes’ rapid and swift action in NBA basketball; the violence and physicality of NFL football; and, the hand-eye-coordination of MLB baseball players, the smooth athleticism of a professional athlete’s body in action gets lost on fans without replay because the action happens too briskly. The annual NBA All-Star Game and its super stars, celebrity filled contingent and 19,800 spectators, all descended on Air Canada Centre in Downtown Toronto and were not dissatisfied as Western Conference outran the Eastern Conference in a record breaking score of 196 to 173. Combined, the teams scored a record 369 points. The previous All-Star Game record was 321 points in 2015. After all the running and gunning, even Paul George’s 41 points (one shy of Wilt Chamberlain’s All-Star Game record set in 1962) and an All-Star Game record nine, three-pointers, could not keep the explosive Russell Westbrook from being named All-Star MVP for the second year in a row. Westbrook tossed in 31 points (including seven three-pointers), grabbed eight rebounds, provided five assists and facilitated five steals. No matter, the day still belonged to the Lakers’ retiring Kobe Bryant. Bryant played in his 15th All-Star Game, which tied him with Tim Duncan for second most all time appearances—Kareem Abdul-Jabbar has the record with 18. Bryant extended his own record by starting in an All-Star Game for the 15th time and he also recorded one steal (his 38th) to break a first-place tie with Michael Jordan (37) for most steals in the games’ history. Also, LeBron James finished with 13 points and Bryant 10 points to become the all-time scoring leader in the Game’s history—James has 291 points and Bryant has 290. Bryant, a five-time NBA Finals champion, a two-time Olympic Gold medalist, an 18-time Western Conference All-Star, a four-time All-Star Game MVP, NBA league’s MVP in 2008 and a two-time Finals MVP had the international gathered in Toronto calling his name. After the team introductions, Magic Johnson came out to specially anoint/announce Kobe. He joyfully exclaimed the noteworthy history Bryant has put down and right after he gave the mike to him and the fans broke into a continuous, “Koooooobe Bryyyyyyyant” chant. That was just the start of the lovefest. A tribute video featuring Bryant’s highlights, his voice and interviews with many of today’s players followed right after. 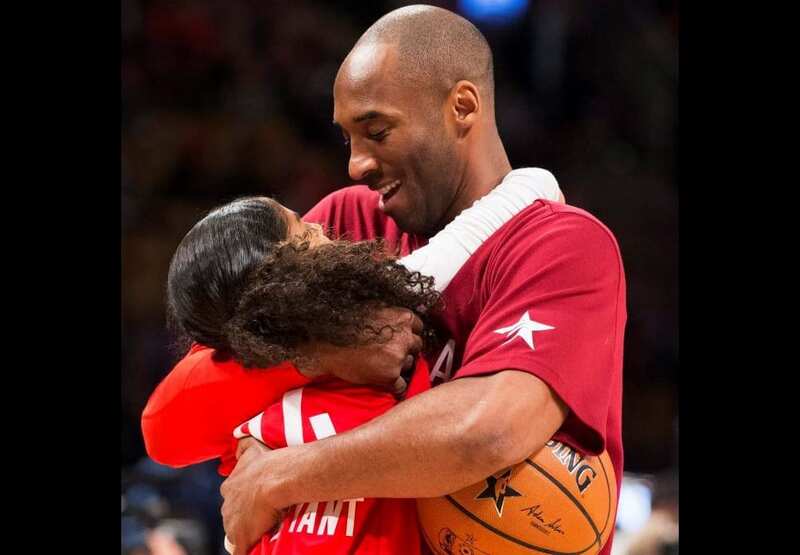 When asked if he talked to NBA legends Bill Russell and Oscar Robertson during the weekend, Bryant noted that he did not feel the role of caretaker assumed after Michael Jordan, Magic Johnson, Larry Bird and Isiah Thomas retired, but he did want to represent the league and himself. “For sure there was a lot of concern voiced from the elder statesmen, including Magic,” Bryant recalled, “about what kind of caretakers AI and I were going to be for the game. Oscar and I have spoken throughout the years sporadically. Russell and I have talked more often, and he’s given me a lot of great advice on leadership and competitiveness and things of that sort,” he shared and continued. “My kids were sitting right behind the bench,” Bryant happily exclaimed, “so I was talking to them virtually the whole game. It may have been Bryant’s farewell, but the NBA ballet went on. In particular, I talked to NBA Hall of Famer and Slam Dunk judge, George “Ice Man” Gervin about the slam dunk contest results. I kind of thought that Aaron Gordon’s dunks were enough to at least earn him a tie if not the win in the most talked about contest since Dominique Wilkins vs. Spud Webb.